There are easier career paths than that of the independent musician. In most cases, you—the artist or band—are the songwriter, manager, social media director, roadie, and, oh yeah, you play music. But, where do you play? And how do you break into those venues? We’re here to tell you. First, know that the advice you find below won’t mean a thing if you’re not ready for the stage. To the serious performer, this means your songs are memorized, your instrumentation and vocals are tight, you have your transitions down, and—lest I forget the obvious—you’re comfortable in front of a crowd. Having gotten those pre-requisites out of the way, let’s talk about getting gigs. It’s all about who you know, so get out there and meet your fellow music makers. You might have thought I was going to say ‘get to know the venues’; that is also important, but that’s not what I’m talking about here. It may seem counter-intuitive, but getting to know and befriend other bands can pay big dividends. Besides the fact that collaborating with other artists will help you grow and make you a better musician, knowing people in the local scene is a great way to hear about gig leads. These people can help; they are not your competition (unless you actually are doing a competition, like Battle of the Bands). The independent music community is a place where you can find rich resources. If you make a connection with other groups and artists, they may be willing to put in a good word for you with promoters or bookers. Or, if you’re a fit, you could become an opening act for them. If you want to know the best places to play or get an introduction, play nice with other local musicians. And, when you get a break, remember to pay it forward for other up-and-comers. You never know who will be the next big thing. The contact information for local booking agents is generally just a Google search away. But before you reach out to these people, find out all you can: their name, their preferred genre, the information and materials required for an audition, etc. If you have a buddy who knows the person you’re contacting, at the very least make sure to mention your friend’s name in your correspondence. Even better? See if your friend will introduce you in person—another situation where networking comes in handy. If you’re trying to play an event or festival, first make sure your genre fits the audience. Your death metal sound may not jive with the bluegrass festival-goers. Second, know that there may be several stages, each with their own booker. Find out who you need to talk to about the stage that best fits your sound. If it’s a bar or a club you’re looking to play, go check out some shows there. Get to know the bartenders. Watch the crowds; find out what they respond to and what seems to bore them. Make a connection with bands that are already playing at the club; a good word from a currently-performing band will go a long way in securing your gig. I should also mention that persistence is a virtue when contacting a new venue. Don’t make the mistake of sending one letter and thinking all your work is done. It may take several attempts to get the attention of the person who makes booking decisions. Whichever way you send it, make sure you have reviewed and edited your communication thoroughly. This includes spelling your contact’s name correctly. I had an opportunity to interview three different PR firms last month to help promote my band. I was surprised by the offer from one of the firms; they spelled my name three different ways in one letter! Needless to say, I did not use them. No, not like that. I mean, make it easy for your potential promoter to listen to your audition. After going through all the trouble of researching your contacts, do everything in your power to ensure they listen to your awesomeness. For example, check (and double-check) that links to tracks and videos are working. Also, be sure to send a link or recording of a live performance—not a shiny studio recording. Your potential booking agent wants to know you’re capable of performing live. As in reflexes. Be ready to respond quickly if a promoter contacts you back—the same day if at all possible. They could have a dozen other hungry musicians waiting to take your spot. If, for some reason, you can no longer take the gig, let them know, and communicate your disappointment in the schedule conflict. They may remember you for the future. When you’re just starting out, you have to build a fan base. To do that, you have to get your music into the ears of potential fans. Unless you’re getting booked every night, take the gigs that come your way—no matter how “insignificant” you think they may be. You can be proactive in these matters, too. Find a cause to support and do a benefit concert. Or, play your neighborhood’s next block party. Just get your music out there. You never know who will show up and catch your amazing set. Then, capture your fans’ info and invite them to future shows. As mentioned earlier, a following will help you land future gigs. 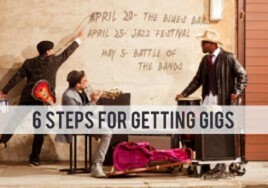 If your material is up to snuff and you are stage-ready, these steps will be instrumental in helping you get your next gig. Need help finding your next show? Do you want a bar? A festival? A house party? Don’t know where to start? 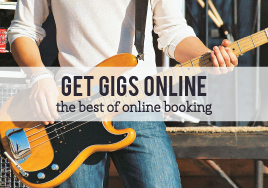 Online booking sites can be a great resource for your band, but finding the right site and knowing what to look for can make a huge difference. Below, we highlight several sites for you to consider. Sonicbids is a streamlined way for your band to apply for opportunities including music festivals, magazines, and gigs. The registration fee is $12.99 for a monthly subscription or $9.99 a month with an annual subscription. When you sign up, you will create an electronic press kit (EPK) that includes photos, streaming music, and video. When you find an opportunity that interests you and your bandmates, you simply pay the application fee, which ranges from a couple bucks up to $50 for larger festivals. GigMasters has the most positive online reviews and best reputation for showing you how to book gigs. Paying the membership fee of $79 for three months does not mean you won’t have to do some work. This requires a professional EPK or resume that showcases why your band is worth the money you are asking for. Including a live music video is a must to demonstrate to promoters that you can play in front of a crowd. Edited music clips are not a good sales tool for live gigging. ReverbNation allows fans, bands, venues, and record labels to create profiles. The basic artist profile, which includes their gig finder service, is advertised as free. However, ReverbNation requires that you have a Reverb Press Kit to submit booking requests, and it charges $5.95 per month for this service (not considering a free trial period). They also offer three different subscription levels (free, $19.95, and $41.67 a month), with a good handful of other services a la carte. For good results with Gig Salad, you’ll probably want at least the semi-pro membership, which costs $9.99 a month but provides access to gigs within a 120-mile radius. Adding music or video to your profile will require upgrading to the pro membership for $19.99 a month, but this also includes an unlimited radius. Gig Salad is also geared toward magicians and other entertainers, but it can be useful for musicians, too. Booking one gig from the site will pay for six months of membership. Want more tips on getting the gigs you want? Here’s 5 Important Tips to Help You Get Gigs. Have you used an online booking site? How did it work out for you? If you haven’t, what’s holding you back from trying one?